As the last in the succession of events I personally arranged for the SDA Bocconi Luxury & Arts Club over the past year, this one, a visit to the workshop/atelier of Buccellati Milano, was perhaps the most intimate and unique. My colleagues and I have become accustomed to more scripted on-campus speeches by the likes of Gucci’s Marco Bizzarri and carefully controlled, secured, and glass-encased experiences like visiting PISA Orologeria to see Parmigiani’s mechanical wonders. Thus, it was a surprise to visit Buccellati yesterday afternoon on a nondescript street near Piazza Cinque Giornate, outside of Milan’s central core, to tour their atelier and workshops and casually examine on our own fingers and wrists their alta gioielleria that is renowned globally. The company has been in operation since 1919 and spans four generations of family ownership and creative direction. One could say it is entrenched here, one of the names that has represented Milanese taste to foreigners and natives for such a long period of time. Buccellati jewels are known for their intricacy, which is still done by hand, using a variety of tools to manipulate and decorate. Within the walls of the atelier, you’ll find young artisans who first have to practice fine etching detail with brass before they are released on to yellow, rose, and white gold. There are of course more seasoned technicians too, though we saw more youth at work than we expected. Typically, items start as a sketch by one of the designers, a.k.a. Andrea Buccellati or his daughter Lucrezia. Then, the metal workers create the shapes and silhouettes from the raw materials with power and non-power tools, including a blowtorch. Next, items go to engravers who mark the shiny surface with many small etchings which give the pieces their unique matte-like finish, characteristic of Buccellati pieces. You’ll never find something from the brand in polished metal. Later, white gold elements are given a rhodium bath and then gems are set by hand under a microscope. A final polish sends items to quality inspection before they are distributed to the brand’s retail network, which consists of directly operated stores, franchisees, retailers, shop-in-shop and corners all around the world. The nearest boutique to my hometown is in Miami, at Bal Harbour Shops. In addition to their “core” of iconic pieces, we also saw items in production of a much more unique nature, like this collana made of gold, later to be etched and embedded with hundreds of diamonds and sapphires. What was so amazing was that the bits and baubles were just laying around, in process. As students of luxury business, but foremost fans of quality and craft, visiting the Buccellati workshops was an awe-inspiring moment for us to see how, truly from start to finish, something like a $35,000 or more bracelet is created. Like fine art, finely-engineered automobiles, or couture fashion, high jewelry is a study in detail, precision, and one-of-a-kind-ness. Since every piece is made by a team of trained and skilled men and women, each is inevitably distinctive and comes with an assumed element of uniqueness. With the proper care, the jewels maintain their beauty and timelessness. 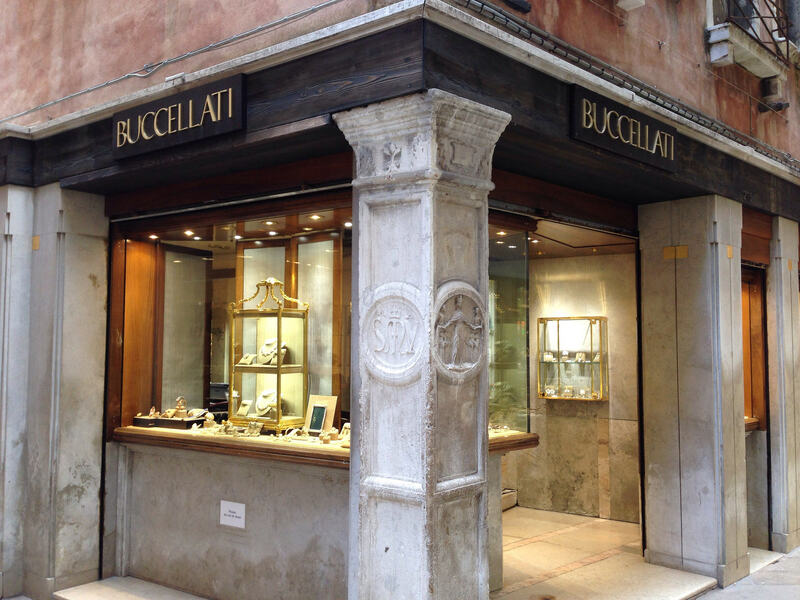 Buccellati also makes precious jewels for men in the form of cufflinks (gemelli in Italian), decor and accessories for the home in sterling silver, and Swiss watches for men and women. With nearly 100 years of history, there is a healthy second-hand market for their goods, which can be found on sites like 1stdibs.com. Back in May, there were rumors of a purchase by Richemont of the brand from both its founders and its investor, Clessidra, but nothing has occurred yet. Either way, in a few short years, I can imagine that the centennial celebration of the atelier’s work will be spectacular! I want to extend my thanks and gratitude for this unique opportunity to my friend John William Barger, who had the contact to provide me initially, and our host and tour guide Simona Meschi, Executive Assistant here in Milan.